Bank of India net banking service may look obscure for casual user, as the bank seems lacking traditional feature of registering online. 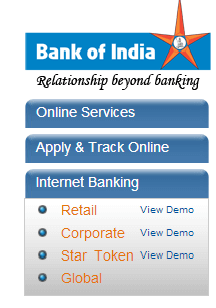 This is a mistake; Bank of India online service is based on a scheme called Star Connect Internet banking service, available in full scale for both private and corporate users. When using Bank of India online service as a private user, please find the “Internet Banking” section on a bank’s main page. Then select the “Retail’ link under this caption. To learn further, please click the on the “View Demo” link and see all features of the Star Connect retail service, as well as instructions about how to use these features properly. Pressing “Retail” brings you’re a new page where you can specify your ID and password to enter Bank of India Internet banking. If you are a new user and plan to register, press the red “New User” link in the string just under the box seen above. A completely new window will appear, guiding you through the entire process of registering a new client. • Using specialized password-keeping utilities such as Handy Password to save your personal Bank of India mobile banking registration data in secure place. An advice: The password keeping, or keyring, utility, allows you keeping all your login and password data in the same secure place (locally or in a dedicated cloud) under the guard of just one master key. When you need a login and/or a password for some particular site, you can call upon a keyring utility to enter the needed account data automatically. Taking these simple measures you will save your Star Connect Reatil Login from most of the disasters able to shake your life in a digital era. The basic procedures for corporate users planning to operate Bank of India corporate banking services are quite the same as for individual clients (also known as retail login). Press “Corporate” under the “Internet Banking” caption. A slightly modified version of registering page will appear, with an extra field called “Corporate ID” placed above the “User ID” on a left side. Options and methods of entering Bank of India Internet banking are the same as for private clients, as well as recommended security measures. However, the security measures must be a bit stronger, as well as procedures of implementing these measures in practice. Always keep your Bank of India net banking login away from thieves and unscrupulous casuals! Take a mention about the two red text lines below the box on a registering page. These red links contain such vital options as “Forgot Password?”, “Trouble Logging in” and “Unblock/Regenerate Password”. When you feel some troubles with your Bank of India login, press the appropriate link without a doubt and follow the instructions to retrieve your personal data. Net banking Bank of India is not only a possibility but also a completely supported activity, allowing achieving the almost endless freedom for operating with your finances through a network. Therefore, join and use Bank of India online banking wherever you wish to. a) Find Bank of India internet site. If you phone them, whomever replies the phone will be aware. It may be that someone at the bank will support you through setting up an online login. If not, it's easy. b) Create an online account. You will require a login and pass. Your user name can be any you select. It might be your own last name, a nickname or a made up name. As long as you can remember it, it makes no diversity. So you need a reliable password. The password is what gives you access to your account. Create your password a conjunction of letters and symbols that exclusively you and other managers of your bank account know. Don't save your password on a sticky paper and keep in close your PC screen. Don't keep it to your table. And do not ever provide it to anyone who asks, whether on the phone or in your mail. Even as if the person claims he is from your bank, he is not. He is trying to get admission to your Bank of India internet bank account. Save your password and give it to no one. c) Pick your weekly bills together. All the bills you would ordinarily pay with a ticket, cover and stamp are now going to get paid electronically. d) Go to Bank of India internet site. You will see dozens of alternatives there. Select and click on the one that has "Set up automatic invoice pay". You can have to click on "Client Service" first and then "Set up invoice pay". Once you open the bill pay page, search "Add Payee". e) You will now see a box with a dollar sign in front of it. Type the number of the bill you are repaying. Be sure to input all number in accurately as you watch it on the bill. Be sure your decimal point is in the correct position. You do not want to forward the program service $700 if you only have to them $70. The computer monitor looks much like a bank check. You have a recipient of payment, an amount and a row to put the expense. f) Now input the daytime you want the dollars to reach at your loaner's department. Normally input the date it is due as you view it on the bill. At times this is the end of the week or day off. Just hold creating the date a day before until it is received by the computer. Do this for each invoice you wish to pay. g) Write the operation down in your check book if you want to get a paper data. h) At any moment, you can return back to your internet bank account and discover what you need paid and if it has been sent yet. As a rule you may know your actual sum. Possibility are you can get applications online as well and even get a weekly email message notifying you what activity took place in the past 24 hours and your bank balance. Bank of India internet banking is simple and saves you much necessary funds at the same moment.